This post is about Noli Me Tangere (aka The Social Cancer), an idealistic novel written to expose the injustices suffered by Filipinos at the hands of the theoretically poor, chaste and obedient Spanish friars during the colonial period. Written in Spanish, published in Berlin in 1887 and banned in the Philippines, it nevertheless reached its target audience. Although the author seems to have preferred reform to armed revolution, violent radicals made him their figurehead, and at the age of 35 he was martyred for the Filipino nationalist cause. See below to find out what you need to know to decide whether you should read Noli Me Tangere, or what you should know about it even if you never do! What does 'Noli Me Tangere' mean? The title is a Latin phrase that means “don’t touch me”. Readers and scholars continue to debate the logic of this title. The phrase once referred to an unknown but particularly painful form of cancer, or a cancer of the eyelids, depending on whom you ask. It is also part of a New Testament Bible verse (John 20:17) in which Jesus addresses Mary Magdalene. 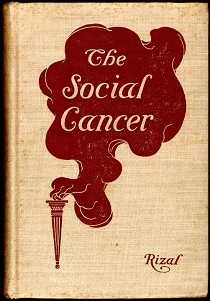 In the book’s dedication, Rizal, who was a medical doctor, explicitly likened the sociopolitical ills of his people to a malignant disease, hence the title of an early English translation. Rizal practiced ophthalmology (eye medicine), so although a cancer affecting the body makes sense metaphorically, it is possible he was thinking of the eyelid cancer. Rizal was inspired by Uncle Tom's Cabin, Harriet Beecher Stowe's indictment of slavery, to write a fictional but informative work about abuses of power in the Philippines. The characters are exaggerated portraits drawn from all walks of life. The protagonist, Crisotomo Ibarra, is loosely based on the author himself, a European-educated young man of mixed race. Ibarra plans to marry his beautiful and virtuous childhood sweetheart, Maria Clara. He also has big dreams of creating more and better educational opportunities for his fellow countrymen, some of whom are embarrassingly ignorant, superstitious or violent. However, powerful opponents stand in his way: local friars guilty of greed and sexual misconduct fiercely defend their dominant position in society. Rizal is an unofficial national hero with an official National Shrine. He helped form a kind of national identity by enshrining his people’s shared values and exhorting them to unify and better themselves. He is sometimes called the first Filipino, because those living in the Philippines did not at the time see themselves as Filipinos. A 1956 law (Republic Act 1425) mandates that all educational institutions in the Philippines include study of his life and writings in their curricula, and that copies of his works be manufactured and made easily available throughout the country. “The Noli” is widely considered the first Filipino novel, despite having been written in Spanish and largely read only in translation, and not actually being the first. The version I read, pictured above, was translated into English in 1912 by Charles Derbyshire. The only English version published previously seems to have been an abridged translation by Frank Ernest Gannett titled Friars and Filipinos (1900) . A subsequent English version, The Lost Eden (1961), translated by León Maria Guerrero, was systematically bowdlerized. Penguin published a new English translation by Harold Augenbraum in 2006. As of 2011, there is a bilingual Spanish/English critical edition edited and annotated by Isaac Donoso.